Widmer is out with this year's entry in the "W" series -- the trial balloon they send up once a year to see how people like it. This time it's a Belgian Golden Ale, and I think they've got a solid entry after a couple of forgettable years. Not everyone likes the Belgian-beer combination of flowery and sweet, and those who do are often hard to please because they've gotten used to the divinely-inspired output of Belgium's many monastery-breweries. For those of us who like the style, and are willing to drink a beer that's 80% as good as the original but costs only 33% as much, W'09 is right on the money. A beer you could compare it to is New Belgium's Trippel. Years ago in Austin I turned to New Belgium Trippel as my inexpensive big beer of choice after Miller shut down the Celis Brewery and deprived me of the wonderful Celis Grand Cru. 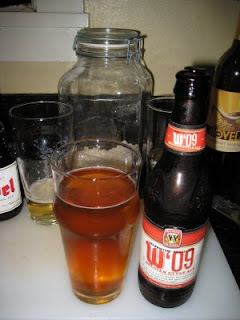 If you like NB Trippel, I think you'll like W'09. Widmer had a few batches of the Belgian Golden out last year, and I was underwhelmed when I tried it at Cheers for Belgian Beers and at a meet-the-brewer event at Green Dragon. Jeff Alworth disagreed with me at the time: he rated it "fantastic" in his write-up of C4BB. I don't know if they've tweaked the recipe a little, or if I'm less snobbish about a six-pack from the supermarket, but my third impression is better than my first two. Jeff's review has a clue that they may have worked on the recipe -- he said its alcohol content was 6.1% at the festival at Roots, whereas the label puts it at 6.5%. I bought a bottle of Duvel so I could see how the W'09 stacked up with the prototypical Belgian Golden. Interestingly, the Duvel was much lighter in color, as you can see in picture -- it was even lighter than my recollection of it. As you might expect, Duvel had a bigger, bolder flavor. I don't think hops played much of a role in the difference, they were pretty low in both beers. Part of Duvel's big flavor is our beloved alcohol -- it weighs in at 8.5% (for comparison, New Belgium Trippel is 7.8%). But the price difference will have me voting for Widmer more often -- it's really about a third of the price. It will be interesting to see if the Belgian Golden becomes a permanent part of the Widmer repertoire. After all, the popular Broken Halo IPA was W'05, and this year's delicious winter brew Brrr was W'06. The Pale Ale that was W'07 was so unremarkable that I can't remember anything about it, and the "crimson wheat" W'08 was an interesting idea that just wasn't very good. I think W'09 might make the grade. What's your opinion? [Correction, 2009/01/14]: Some people -- Jeff, for example -- liked W'07. It is now going to be a year-round Widmer offering, named Drifter. It was a surprise to me; my wife brought it home with the groceries. So much for being local beer experts, eh? Is this the same as the Golden Belgian they've been serving at the brewery and restaurant or is that a Belgian Blonde? I kind of like that in-house beer. It's not very complex in malt or depth of flavors, but does have a very clean refreshing taste with some coriander and a peppery bite. I'd buy a 6er of that.... during the summer. Mike: Sounds like the same one. The webpage for the Gasthaus says W'09 is on tap now, so I'm guessing yes. Bought her a bottle of Oregon wine. Got myself a sixer of Deshutes IPA. I had Widmer's contribution at CTBB as well, and much like everything else there, the Ardennes yeast overpowered whatever other flavors the beer(s) may have possessed. I hope it's not the same recipe, or if it is that they used a different yeast. If it's close to Duvel, I'll probably like it (I love Duvel); if it's closer to Delirium Tremens, I probably won't. If it's closer to La Chouffe, that would be much better… I'm just gonna have to try it. anónimo: I hope you'll comment again after you try it. It reminded me of NB Trippel... I don't know if I'd say it was as similar to Duvel. Finally got around to trying the W'09 this weekend (Drifter was nowhere to be found); I'd call it a Belgian "light" golden - the kind of beer you might give to the uninitiated Bud drinker to try to introduce them to better beers, but you yourself wouldn't necessarily drink on a regular basis (unless you were just that hard up for cash). That's not to say it's bad, just that it isn't much… it is somewhat - distantly - similar to Duvel in flavor profile, but Duvel is considerably stronger - Piraat even more so - and IMO worth the extra couple bucks for a bottle. anónimo: Thanks for coming back with your opinion. I'll agree 50% with your statement above: you're absolutely right that beers like W'09 are ideal for novices. They can try it and see if they want to explore Belgian styles further. Still, I think I would drink it myself fairly regularly, since the price is right and not every beer has to be a life-changing experience. Drink the good stuff first, and if you still want more, shift down to lighter and cheaper ones :-). If I ever wanted more, I might agree with you… but I'm not a large-quantity consumer, and am usually done after a bottle (or pint) of the good stuff; I have no need to stock up on sixers of the cheap stuff. Plus, I'm always trying something new - even those which I love and know I only drink once a month, at most - I don't have room for the familiar. "…not every beer has to be a life-changing experience." But wouldn't it be awesome if it was? :) I'm still ever chasing that perpetual high, and my threshold level isn't yet to the point where I can't reliably find it (though there have been times I walk into a brewpub or taproom and can't find a single thing on the menu that "inspires" me) - another reason I don't drink large quantities.